Sounds like a good day to start our month driving around New Zealand! So it’s good bye to Gary and Elise’s house in Christchurch, and hello open road. …and I’m up 150% on my gambling. Yup, wagered a whole $1 and won $1.50. I’m turning in to a real high roller! …pretty damn good. It’s a cross between superhero comic and spy thriller, with more than a nod of the head at classic James Bond, all animated with a touch of New Yorker cartoon, Chesley Bonestell spaceships, and pop art children’s picture book. In other words, another Pixar triumph. Today has been mostly spent walking around a block or so of the strip, taking in various park-like bits of the big theme hotels. The Flamingo has penguins (and flamingos), while The Mirage’s dolphins and various big cats are very impressive indeed. For those who need to know, fake Italian skies are still in. 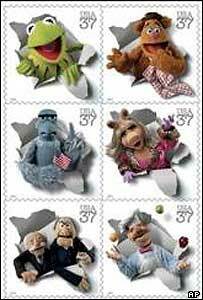 There’s going to be a set of Muppet stamps in the US. Launching in March, they’ll include 11 different images of popular muppets and their creator Jim Henson. There’s an interesting list of early PCs and gaming systems at the web site for Gordon Laing’s book Digital Retro (another one for the wish list…). It looks like I’ve used quite a considerable number of these beasts in the past – and owned more of them than I’d thought. I’ve bolded those I’ve used, and underlined those I’ve owned. And by used I mean more than typing “10 Print “Hello World”: Goto 10″ on a machine in a high street shop! So how about you. What were your training wheels for the world we have today? …it’s the teaser trailer for the next Pixar movie: Cars.